A recipe from my Slovak daughter-in-law – just the thing for last-minute Christmas presents. Easy for children to make too. Makes 24. Grease and line a baking tray with greaseproof paper or baking parchment. Mix all the dry ingredients together – flour, sugar, nuts and bicarbonate of soda. Beat in the honey and eggs (plus the liqueur, if using). This will make quite a stiff but sticky dough. Shape into walnut-sized balls and space generously on the baking tray – they will spread quite a lot while cooking. 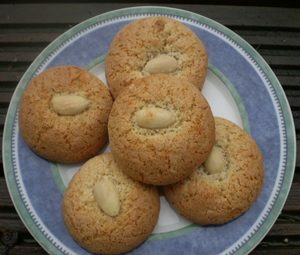 If liked, press a whole almond or walnut chunk into each biscuit. Bake them in two batches of 12 biscuits. Bake in preheated oven at 180°C, gas mark 4, for about 9 mins until golden brown. Lift them gently out of the tray onto a cooling rack as quickly as possible, while still warm – they will be difficult to handle once cold.